If you nominate this PSD converter for a versatility race, it will run circles around any of its presumed opponents. 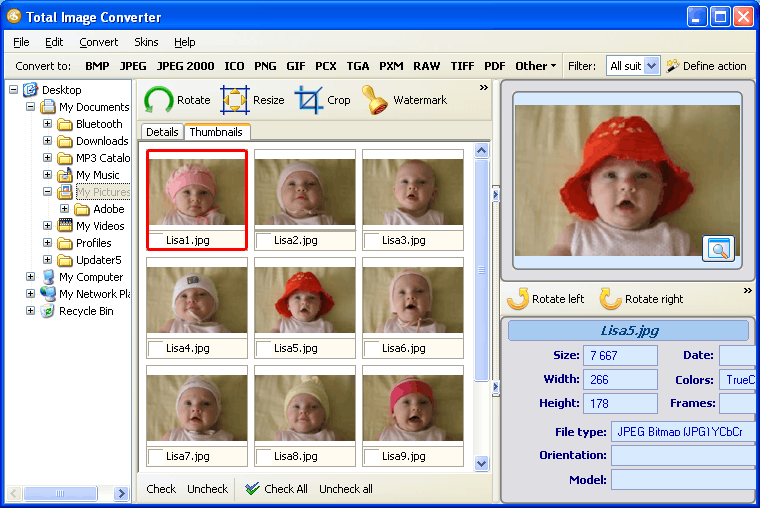 This unique image conversion application features batch mode, which you can apply when you are pressed for time. The trick is that you can press a couple of buttons, and the program will render three hundreds of PSD images in PCL in minutes. Indeed, there is nothing really tricky about it. You should only know where 'Check All' button is, and that is no great challenge anyway! You will know it the nanosecond you take a look at the interface. 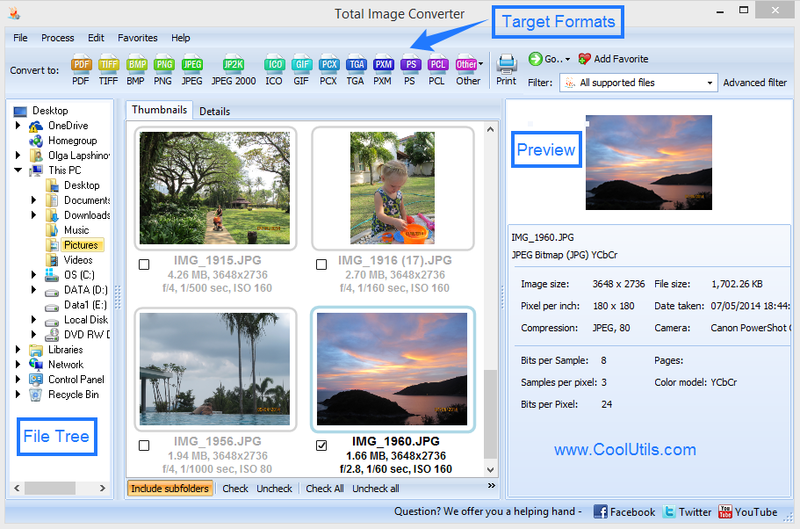 Apart from batch-conversion, this converter features options allowing you to crop, resize, rotate and watermark your images in your most preferred fashion. These options are available on interface and are featured in the wizard. The built-in image viewer provides a great opportunity to evaluate output image quality. This batch image converter can be run in three ways: via interface, via right-click menu and via command line. The interface is very easy to navigate. Use the folder tree and select the folder with source files stored in it. The image list will be shown in the middle section. On the right, you will see the viewer. If you click on a file in the list, the image will appear in the viewer. Use the options to edit your images. Watermark option allows you to supply your images with dates, time and comments. To convert PSD to PCL in batch, press 'Check All' button and check all the files. To convert one or a few PSD images, tick them manually. Also, these options are represented in the wizard. Here you can choose destination folder and adjust image quality. This is optional, so you can skip these options and use default settings. Click 'Start'. 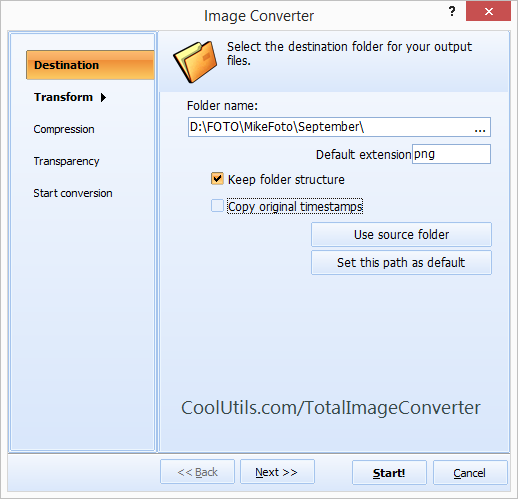 It will take a few minutes for the converter to render PSD files in the PCL format in batch. This PSD converter integrates into the OS, so you can launch it via the context menu. To do so, right-click on a file and click 'Convert to'. Command line is for advanced users. If you have purchased the license version, you can use all sorts of technical supports for free and enjoy all the advanced features of the program. If you would like to try it prior to purchase, download the thirty-day demo version. Save PSD as ICO in batch without any problems. Turn PSD to PS in batches efficiently. Convert PSD to PCX. Save time, it's easy. 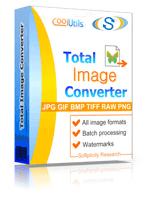 Convert PSD to GIF for images. Converting PSD to TIFF in batches has never been so easy!